The Top Ranking Urine Test from ARKRAY: "AUTION MAX AX-4060"
Ever since developing the AUTION ANALYZER UA-6, The world's first automated analysis system for use with urine test strips back in 1972, it has been no exaggeration to say that ARKRAY has been the world leader in the automation of urine testing. In 1985, 13 years after the development of the AUTION ANALYZER, the development of the Super AUTION SA-4220 pioneered the concept of a fully automated urine analyzer and promptly went on sale. After the development of this, ARKRAY continued to specialize in fully-automated urine analysis and continued to work to provide added values to its customers. Reagent took the form of a cartridge with the Super AUTION II, which came with improved ease of use. Further improvements were made with the Super AUTION EX (Extra) which was capable of using a robot arm to move cartridges after measurement making handling easier. 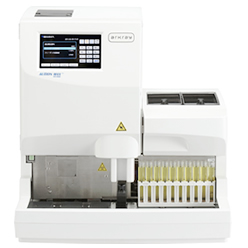 Following this, the AUTION MAX AX-4280 managed to integrate automatic urine testing technology and literally became the top, or rather the MAX, fully-automated urine analyzer. From its birth to the present day, the AUTION MAX has been a great success worldwide. As a pioneer, ARKRAY was determined to surpass this maximum and continue as the leader in urine analysis. On the basis of this decision, ARKRAY has developed the latest model of AUTION MAX AX-4060. An urine test strip consists of reagent filter pads attached a layer of film and is long, delicate and fragile. The fragile strips must be accurately supplied into the analyzer one by one from the test strip feeder. 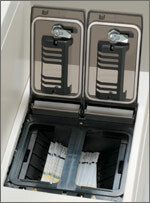 The test strip feeder is known as one of, if not the, key characteristic unit of the AUTION MAX. It is capable of feeding out hundreds of test strips one by one, at a rate of one every 16 seconds. This was the starting point for the complete automation of urine test strip measurement and was the component of much effort during the development phase. To make the new AUTION MAX really worthy of its name, our development effort was driven by the perfection of this feeder. The basic principle of the feeder has not changed over the past 30 years. There is a groove to ensure only one test strip is fed out onto the table at a time. The table moves from left to right allowing the test strip to easily enter the groove and is fed under a dividing wall in the reagent housing, making sure that only a single test strip is offered up at a time. If this action is too quick, filter pads become separated from the base film and the test strip becomes useless. Yet, if this process is too slow, the test strips never come out. Accumulation of ARKRAY technologies and know-how were successfully integrated to achieve the best feeder mechanism. In the latest model, the grooved table has become a drum, and as it revolves it feeds out test strips. Also two areas are available to store the test strips allowing the selection between two different types of strip. Also, the number of strips that can be loaded into the feeder has increased and a mechanism has been incorporated that can determine which way the strip is facing ensuring the test strips are always fed out facing up. The AUTION MAX works by aspirating a urine sample with the nozzle and applying it to a test strip. This is another area which received much attention and efforts during development. A single measurement is repeated at high speed every 16 seconds and in this 16 seconds, not only does the sample have to be applied to the test strip, but the nozzle must be cleaned prior to the next measurement. If the nozzle cleaning is not performed adequately the current sample may become contaminated by traces of sample from the previous measurement. However, if the cleaning takes too long, there is a chance that cleaning fluid will remain in the nozzle and dilute the sample during aspiration. Our developers spent a good deal of energy racking their brains over how to achieve this delicate balance. Of course it would have been easier if we had increased the amount of time available for each measurement, but it was a big challenge to achieve the best timing for all the necessary procedures within the limited 16 seconds. But then, developers struck upon the idea of having air segments inside the nozzle creating a barrier between sample and cleaning fluid, and between samples to reduce the risk of sample contamination. However, there was a disadvantage with the air-segment method. The air would act like a buffer in the tubing but would increase and decrease as the machine tried to accurately move liquid around the system. This proved to be a difficult problem. To cope with this, we added a mechanism that could effectively insert the air segment into the tubing during liquid movement. A special tube was introduced into the part that held the air segment and when switched to the tubing without the air segment it could perform aspiration, and switch back to the first air-segmented tube for cleaning. Thanks to this, the latest model of the AUTION MAX has succeeded in almost completely removing the potential problems of sample contamination and dilution with cleaning fluid and we have succeeded in achieving 100% performance of the reagent. AUTION MAX derives its name from being achieving the maximum in performance, the leader in fully-automatic urine analyzers and ARKRAY conducted development with a view that the analyzer to succeed this one must also be a Max. So we have briefly mentioned just some of the functions that went into the development of the AUTION MAX. The AUTION MAX was constructed with the aim of being the best (the Max) and it currently is a top product.